Masses of scented, white, jasmine-like flowers appear on arching branches in mid and late spring among glossy, dark grey-green leaves with finely serrated edges. This evergreen shrub can occasionally grow up to 6m tall, but it usually retains a more compact and rounded, bushy shape. It thrives on well-drained soil in dappled shade. 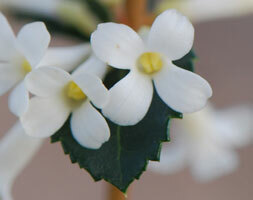 To enjoy the fragrant flowers, plant near an entrance or well-used path.